Rome, Italy, 30 October, 2017 – The financial, social, and environmental benefits of sustainable wood value chains will be among the topics for discussion during a two-day global meeting – Sustainable Wood for a Sustainable World (SW4SW) – which is drawing experts from all over the world to FAO Headquarters in Rome. 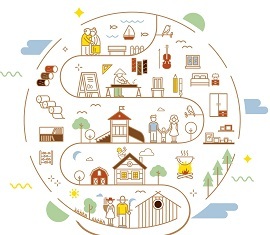 Participants at the SW4SW event, which begins tomorrow, will consider how best to derive the maximum benefits for society from sustainable wood value chains and the challenges that currently hamper their full contribution to sustainable development. Discussions will also include the business models of sustainable wood production, particularly the links between sustainable forest management, livelihoods, investments and financing mechanisms. Participants will also consider how sustainable wood production can help to fulfill the Sustainable Development Goals (SDGs). Partner organizations involved in the event with FAO include the Center for International Forestry Research, the International Tropical Timber Organization, the World Bank, and the World Wildlife Fund. James Astill of The Economist Group will moderate the event. Topics that will be discussed in break-out groups include how to provide greater support for countries that are working to improve governance and transparency as key steps in progressing towards initiatives such as the Voluntary Partnership Agreements (VPAs) that are a pillar of the Forest Law Enforcement Governance and Trade (FLEGT) Programme. VPAs between the European Union and timber-producing countries promote trade in legal timber products and help to close the EU market to illegal products. A set of conclusions agreed upon by participants at the SW4SW meeting is anticipated, with the objective of feeding that into other policy dialogues. This, in turn, will contribute to a better understanding of the socioeconomic and environmental benefits of sustainable wood worldwide, as well as its contribution to the SDGs, and to climate change mitigation and adaptation. An exhibition during the SW4SW meeting will showcase various stages of the wood value chain. The display, in FAO’s David Lubin Memorial Library, will present examples of companies and cooperatives’ experiences using sustainable wood. This will include a company working to improve ebony growing and processing in Cameroon; a cooperative of Finnish farmers that is leading the world in ultra-high-efficiency biotechnology industrial production; and an association in Uganda that brings together large and small producers of trees to increase the sustainability and profitability of the country’s forest industry.